Have you ever wondered exactly how professional online players make their living? Of course you have, you nosy sods, because we have too. Well don’t worry, we’ve managed to rustle up some pros to share and talk about their monthly graphs so you can snoop to your heart’s content. 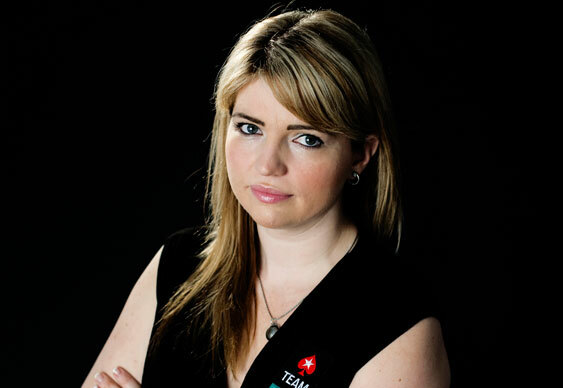 This month we talk to Team PokerStars Online Pro Adrienne ‘talonchick’ Rowsome, a well-respected mixed game specialist from Edmonton, Canada. Adrienne: September is always a hyped-up month for me – I start thinking about it in early August or when the WCOOP schedule is released. I have to make sure that my work and personal schedule is cleared to ensure I am available to compete in my preferred tournaments. For mixed game players there are only a couple of times a year when you can get into tournaments with huge guarantees. One of the side effects of these tournaments is that the cash games also become livelier and there are more tables to select from across stakes. 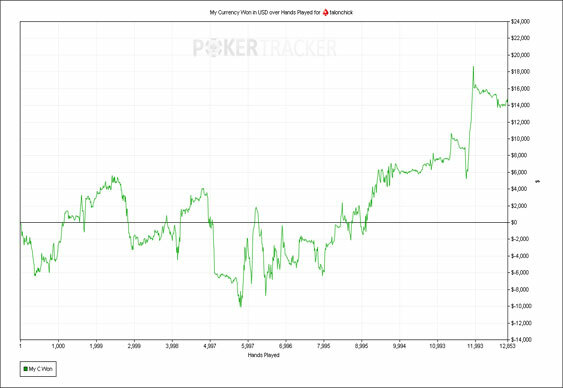 Looking back through my database, it seems I played about 30% more cash game hands than usual. I dabbled a bit in NL O8 but played the bulk of my hands in my preferred game, limit O8. Limits varied from $5/$10 up to $75/$150 in both six-max and full-ring formats, with a strong preference for six-max tables. I won just over $18k in 2,311 hands at $75/$150 for the bulk of my profit in September. My biggest losses came at $30/$60 where I lost just over $9k in 3,483 hands. 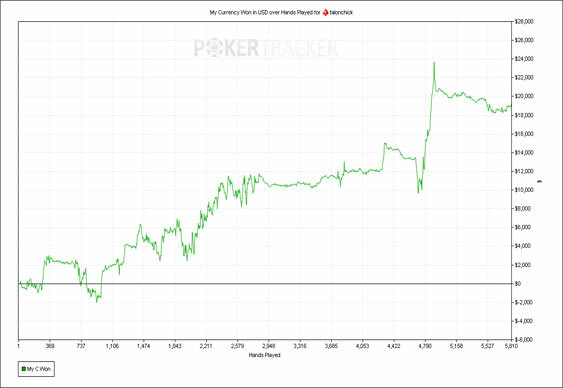 Overall, I ended up with a profit of just over $12k from cash games, plus whatever FPPs I earned. As you can see from my first graph, I struggled to get any traction for the first half of the month, but things seemed to take a big turn from September 17 onwards (second graph). That day is of pretty big significance to me, as it’s the day I found out that I was pregnant. Coming from poker playing parents, perhaps this baby already has a knack for poker, seeing as my graph headed upwards as soon as its presence was noted. Goals for the upcoming months will be centred on making sure I play optimally for the opponents in the game and that I remain selective with hands that I continue past the flop with. It would be ideal to finish each month with similar results to these!